Your 12-year-old jumps off the roof and onto the trampoline, heedless of the danger of broken bones. 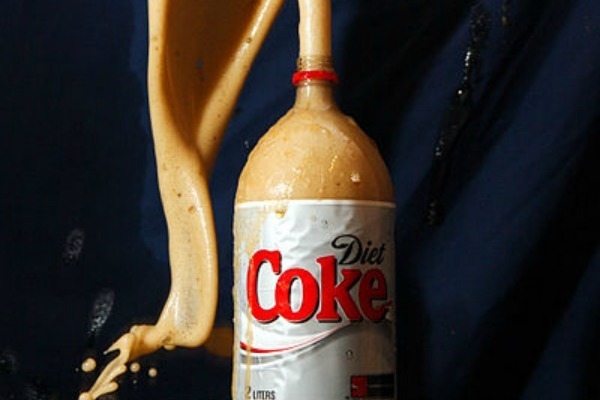 Your 14-year-old experiments with dumping six rolls of Mentos into a gallon of Diet Coke – inside your kitchen. For years I have explained to parents that this kind of behavior is due to unbalanced brain development. The back part of the teen brain, the part that says, “You know what would be cool/fun/exciting?” is much more active than the front part, which says “Not a good idea – you could get hurt/paralyzed/dead.” Asking your teen “What were you thinking?” after the fact will get you the same results as asking your dog why he chewed up the couch: a blank stare and shoulders hunched in guilt. I read an article this week on the website of one of my favorite magazines, Mental Floss, which gave brain-related explanations for other teen behavior, including giving in to peer pressure (it actually activates the reward center of their brains), being overly emotional (they have a hard time reading faces and may mistake your look of confusion for one of disgust), and spaciness (their brains are rearranging themselves, much as they did when they were toddlers). Knowing that much of what they do is caused by their goofy brains, can make their annoying behavior a little more tolerable. It doesn’t give them an excuse to be lazy or disrespectful or irresponsible, but it may help the adults who deal with them to be a little more patient and understanding. At least – every other day or so. 1. When we hear you say, “My kid tells me everything,” we shake our heads with sadness, because we know you are being seriously manipulated. Your child tells you 1) what makes him look good; 2) what he thinks you want to hear, and 3) whatever will push your buttons to make you mad at the school or teacher and let him off the hook. Seriously, what teen ever tells a parent EVERYTHING? 2. We wish you’d help us fight the dress code battle. I had a parent once who, after I pointed out in front of her that her daughter couldn’t wear that at school, turned on her daughter and said, “See? I told you!” If she’d already told her, then why was her daughter at school in that outfit? Why had she been allowed out the door in it? I know why – because Mom wanted us to fight the battle instead of her. 3. It’s time to stop cutting the crusts off your teenager’s sandwiches. This speaks volumes to us about your parenting style; you’re not ready to s ee your child as an adolescent. You might also still be picking out his clothes, ordering for him in a restaurant, and cleaning his bedroom. While you say you’re doing it because you love him, what you’re really doing is delaying his independence. He won’t wake up one day and suddenly be a mature and responsible adult; you have to give him a chance to practice. 4. What seem like little things to you – chewing gum or texting at school – are big issues to us because they mean a student does not respect the rules. “You’d really suspend my daughter for texting at school?” No – we’d suspend her for repeated acts of defiance, because if she’s continually breaking one rule, chances are we’ve caught her breaking others. When you downplay the situation, it only encourages her to keep seeing what she can get away with. 5. When we tell your child “No, you can’t,” and he gets angry and argues with us, we know he’s doing so because it works with you. The same goes for whining – we know he’s using it on us because it gets him his way at home. Hold your ground in the face of arguing and whining, and you’ll help your child to be more socially acceptable at school – and eventually in the workplace. 6. When we hear your teens use “please” and “thank you” without prompting, and we see them holding the door or letting others go first, we know you have taught them to be polite and considerate of others. This is also true when they apologize, clean up after themselves, and refrain from interrupting. It makes us think good thoughts about them – and about you!